As the days grow shorter and fall approaches, newly emerged monarch butterflies become restless. Although the bright orange- and black-winged insects currently visiting backyard flowerbeds may appear identical to those seen earlier in the summer, they are biologically different from all others. The group of adults currently flittering about are so unusual that scientists give them a special name—this year’s final crop of young are the annual super generation. Unlike their predecessors, whose entire life cycle could be measured in mere weeks, super generation monarchs complete a 3,000-mile-long migration marathon, acquire the remarkable ability to halt aging and then stay alive for more than eight months—the rough equivalent of a human living six centuries. The annual cycle begins high in the remote volcanic mountains of central Mexico. 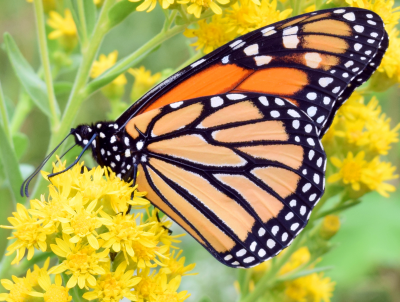 With the arrival of spring, monarchs that hatched the previous summer in Canada and then migrated to Mexico last autumn suddenly respond to the irresistible call to move north. But their second migration will be brief and adults will never see their Canadian homeland again. Arriving on the plains of Texas, the ancient insects pause to mate, lay eggs and die. Caterpillars emerge, grow, form chrysalises, and become adults. Second-generation butterflies continue the flight north. Soon they, too, will stop to mate, lay eggs and die. The cycle continues until, four or five generations later, in a few months, monarch butterflies began appearing in Iowa. The airborne relay race continues until, sometime in August, the species reaches its final destination on the Canadian prairies. Arriving at the relay’s northernmost finish line, these adults are the great-great-great-grandchildren of the monarchs that left Mexico just four to five months earlier. It is their offspring that become super monarchs, that unique generation that embarks on one of the animal kingdom’s most incredible journeys. Unlike previous generations, super monarchs do not mate or lay eggs right away. Instead, they devote all their energy to feeding. Their only interest is to drink nectar and build fat reserves for the grueling task ahead. But the seasonal clock ticks with little time to waste. Within days of emerging as adults, the super generation begins to move southward. Not just in a general southerly direction, mind you, but rather on a specific and well-defined course that leads to the exact same winter roost trees used by their great-great-great-grandparents the winter before. Taking advantage of favorable breezes, monarchs travel 50 to 60 miles per day, taking time to replenish spent fuel reserves as they continue to gain weight during migration. The flight is not without casualties. Losses from storms, unexpected frosts and highway traffic exact a deadly toll. To a casual passerby the spot would likely appear insignificant, if it would even be noticed at all. Just a scraggly cluster of 20 ash trees, with most reaching less than 20 feet in height. Located in the heart of the 2,200-acre prairie wetland complex of the Union Hills Waterfowl Production Area in Iowa’s Cerro Gordo County, the volunteer trees are the last reminder of a long abandoned homestead. Read more about the monarch migration on the Iowa DNR's "Take it Outside" blog.